Between end of September and beginning of October. Fontevecchia is one of the most popular wines produced by CasalFarneto Wine Estate. Wine of great expression, it is a variety of Verdicchio Classico Superiore, elegant and very pleasant, on the palate a wide range of fruity and floral aromas stand out. Fontevecchia is produced in the company-owned vineyards of central Le Marche on a soil of medium to loose consistency, with southeast exposure. The wine is obtained with the technique of “vinification in white” with soft pressing of the clusters and thermo-controlled fermentation. Refinement takes six months in steel tanks and at least four months in bottle. Perfume: Wide, fresh and persistent smell reminding of lime, white flowers, almond and Summer fruit. Flavour: Wine of great varietal expression. In the mouth, taste confirms the smell sensations developing in balance between freshness and savour. It is fine and persistent with a slightly bitter aftertaste. Fresh as an aperitif, it goes very well with warm or cold appetisers, white first courses, mushrooms and truffle, white meats. Excellent with any seafood dish, being it simple or more elaborate. 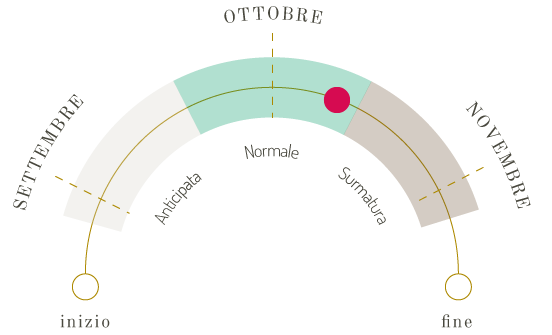 It is the traditional harvest, taking place in the months of September and October, allowing a harvesting with the right balance of sugars and acids in the wine produced.